The plan was to work on the red, white and black Rail Fence. I was going to trim the blocks and Sydney would assemble the quilt top. The Bobbin Winder fiasco threw that plan off, and then Sydney said the quilt didn’t have a deadline, but she had another that did. Her teacher’s child has been in the hospital and she wanted to give her a quilt. I’m not positive how it came about, but my husband asked me if I had any partially completed tops Sydney could finish for this quilt. I looked through my UFOs and pulled swap blocks. 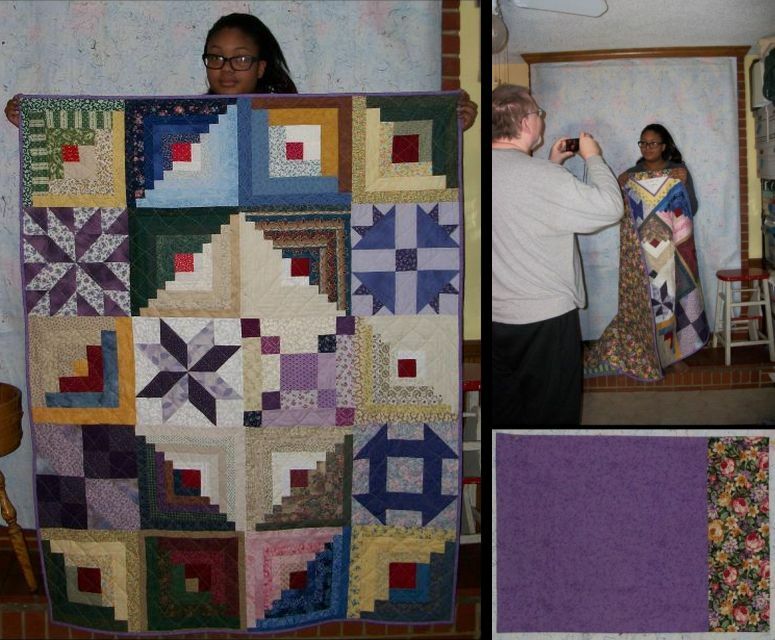 Between my husband and Sydney they decided the 7 purple blocks and 14 log cabin blocks could be put together into a quilt. 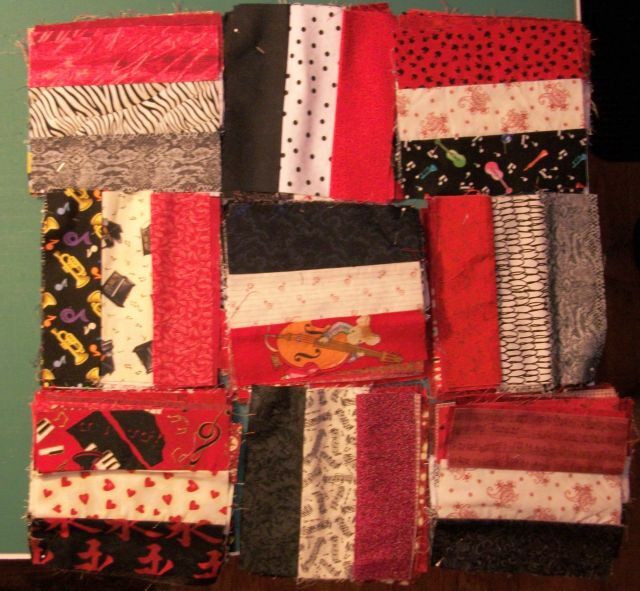 These blocks had been given to me by another quilter who didn’t think she would get around to making anything with them. I had them on my Quilts In Progress list as two quilts. They make an awesome quilt together and I get to cross 2 UFOs off my list! 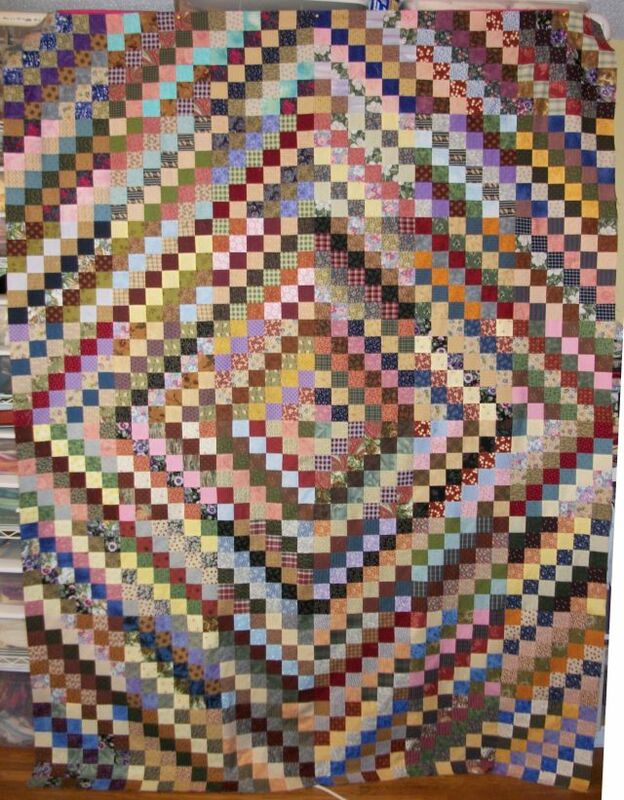 The quilt finishes at about 47″ x 58″. Soft and Bright batting. Yellow thread in the bobbin and top. Quilted in a wavy crosshatch. Also “completed” this week is Scrappy Trips which I made on my grandmother’s treadle machine. I know how I want to quilt it, I just have to decide on a backing fabric and decide if I want to attempt to quilt it on the treadle. Up next — trimming the rail fence blocks for Sydney’s next visit and figuring out how I’m going to quilt Deadline III. To see what others are working on, checked out the links over at Patchwork Times.